There has been a resurgence of interest in all things Celtic, including the historic church of the British Isles. The problem is there is really little information available on the specifics of the church in Ireland, Scotland and Wales. What little we do possess gives us a rather strange picture of the church in the British Isles when compared to the Christianity found in other parts of the world. The Celtic church is an enigma even for modern historians and theologians. On the one hand you had a church that was seemingly orthodox and, in what can be called a proto-Protestant spirit, resistant to Papal control, for which it has become the fancy of some Evangelicals and Eastern Orthodox Christians. On the other hand you have a church whose primary religious order of authority possessed a character that was quite nature centered; focused not just on God as transcendent deity, but also on God immanent in His natural world. A sort of panentheistic theology, akin to that of the Moodernist heretic Matthew Fox. This Celtic religious order I speak of was the Order of Culdees, the inheritors of much of the ancient Druidic tradition and spirituality, not to mention spiritual influence in Celtic culture. The name Culdee itself is of confusing origin and many opinions have been offered to explain it. The most likely is that it comes from the word “culdich”, meaning“certain strangers.” This makes sense considering that Celtic Christian tradition has it that in 37 A.D., followers of Jesus Christ appeared on the shores of the British Isles to spread the Gospel. These followers were said to be Jewish, and if so, would certainly have looked different, dressed different and spoke a foreign language. Some traditions say that Joseph of Arimathea was the leader of this band of disciples, who had himself visited previously with the young Jesus, though this has no evidence to support it, and is almost certainly pious myth. Whatever the case, these strangers were granted an audience by Arvaragus, the king of that particular region. The king found them kind, humble and worthy of his trust, so he decided to give them a place to live in the local Druid community. Later the same king granted them a plot of land equal to “twelve hides”, where they are said to have built the first Christian Church in the British Isles. Folk tradition has it that this church was built on the very site of the now ruined abbey at Glastonbury. 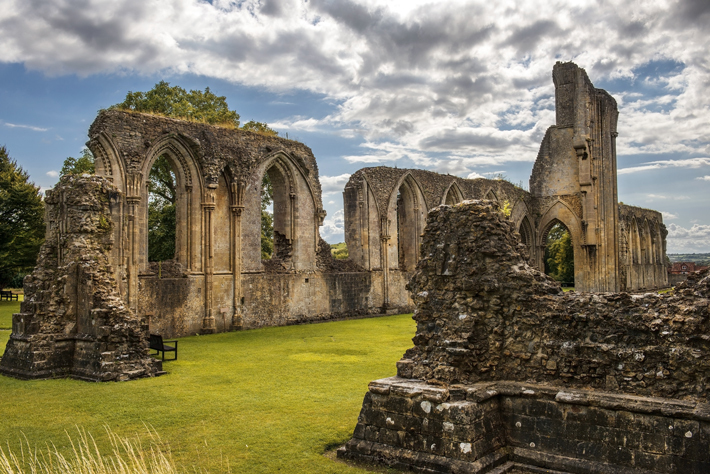 This does not prove the folk tale to be accurate, but merely proves an ancient origin for the abbey itself. It could very well be that the monks of Glastonbury invented the story of Joseph of Arimathea themselves to keep the faithful donating to the monastery. Such things were quite common and gave rise throughout Europe to various churches claiming to possess the body parts and personal belongings of various Biblical figures, and enough wood claimed to have been from the cross upon which Christ was crucified to build a ship. Further documentary evidence does exist to show that after the building of the Glastonbury church, a group of Druids converted to Christianity. It would have been no surprise that since these Druids already possessed spiritual authority and influence among the people, they would have eventually been ordained priests, and certainly began to convert others-including other Druids. One of the questions we must ask is, what was it that encouraged these Druids to convert to this new religion, leaving behind the path of their ancestors? Was it through a sincere faith in the Gospel? I cannot go so far as to say that every Druid who converted did so for reasons other than faith, since I do not have the ability to see into men's hearts, but I suspect there were other motivational factors at play, at least for some of them. The first thing we have to understand is that Druidic spirituality was syncretistic. That is, it absorbed elements of various philosophies and religions the Druids came in contact with, much like the New Age Movement of the current era. The first Druids traveled to Britain from the Balkans finding philosophies and religions similar to theirs and adding what seemed to them a good fit. So when these Druids met the “culdich”, it was natural for them to adopt the truths that seemed right to them in this new religion. Add to this the fact that these strangers would have received their teachings first hand from Jesus Himself, so they were primary sources, and this would have appealed to the Druids immensely. Keep in mind that the Christianity of that time was not the Christianity of today. It wasn’t influenced by the Papacy as we know it, nor the yet to come Reformers. It wasn’t a religion that was used to subdue and control a tribe or nation as was to happen in the future. At the point the Celts first encountered Christianity (if the stories can be taken at face value), Christianity was not yet as intimately connected to the Imperium. It was a simpler faith without the baggage of much of modern Christianity. Of course, this also means that the Druid converts quite possibly wouldn't have had ongoing guidance in biblical orthodoxy either. And as Druids were very powerful in Celtic society, once these former Druids had converted, they could control potentially the direction of this new faith in the British Isles. The Druids, besides being the priestly class, were the intelligentsia. They were the physicians, priests, naturalists, musicians and historians of their people. To become a Druid one had to memorize the entire corpus of Bardic works and all other collected knowledge of their people without the benefit of writing anything down. No simple challenge, and not one for the ignorant. Thus they were held in very high esteem as a protected class. It was considered a great crime to kill a Druid, even in war. As the protectors of their peoples' history and heritage, we can reasonably assume there was something in this new faith that they felt was the fulfillment of their spiritual path, and not some betrayal of their people or traditions. When these Druids converted, they didn’t just drop their traditions, they brought many of them into their Christian faith with them. We can find evidence of this in the symbolism and sacred places of Celtic Christianity (geese, trees, groves, wells, and other creation centered symbols), as well as in such writings as the Carmina Gadelica. Furthermore, Culdee saints are said to have talked with animals, much in the same way that Saint Francis of Assisi was said to have done, and groves, springs and wells were considered holy. Yet another 19th century historian, John Jamieson, wrote in his “Historical Account of the Ancient Culdees of Iona” that there is a.. He too notes the Culdees having inherited the Druidic holy places, writing that one of the well known Christian churches at Clachan “originally belonged to a Druidical temple.” Indeed, even the unique style of tonsure the Culdees practiced was unlike any in the entire Christian world, but was exactly the same as that of the Druids. What all of this demonstrates is that the romantic notion of the Celtic church as a purer form of Christianity may indeed be wrong, and that the evidence points to an early Druid influence that was perhaps good in some respects, and not so good in others. A positive view of Man's relationship to the created world is certainly something to be desired, but when that relationship is paganized, and we find "sacred groves" and "holy wells" being promoted as Christian, we know we have some problems to be addressed. At any rate, the Celtic church eventually submitted to the authority of the papacy, until the English Reformation of the 16th century, when the Anglican Church once again asserted its independence and experienced the blessings of the Reformation. Very well written. Do you think it is ok for me being a Christian to celebrate passover and not Ishtar.Thanks, Robin Fedukovich.